The Kentucky match will be streamed live on ESPN3 (there is a different link on GoPSUsports.com: Watch Penn State vs. Kentucky, which we think is audio-only, but which we think is free) . Stats coverage is from GameTracker. The Wildcats earned their spot in the Sweet 16 with a 3-0 sweep of East Tennessee State in Round 1 and a 3-1 Round 2 win over Ohio State. Kentucky was led on offense by 6-5 So. OH Lauren O’Conner’s 16 kills, followed by 6-2 Jr. OH Whitney Billings and 6-1 J. MB Alexandra Morgan, who each posted 10 kills. Morgan led Kentucky with seven blocks and Billings totaled 12 digs. 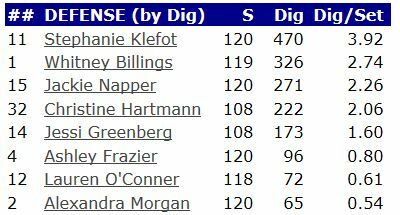 Three-time SEC Libero of the Year 5-6 Sr. Stephanie Klefot posted a match-high 18 digs. Sr. S Christine Hartman registered 41 assists. Klefot and Billings were named American Volleyball Coaches Association first-team All-South Region team members on Tuesday. Hartmann was an honorable mention selection. 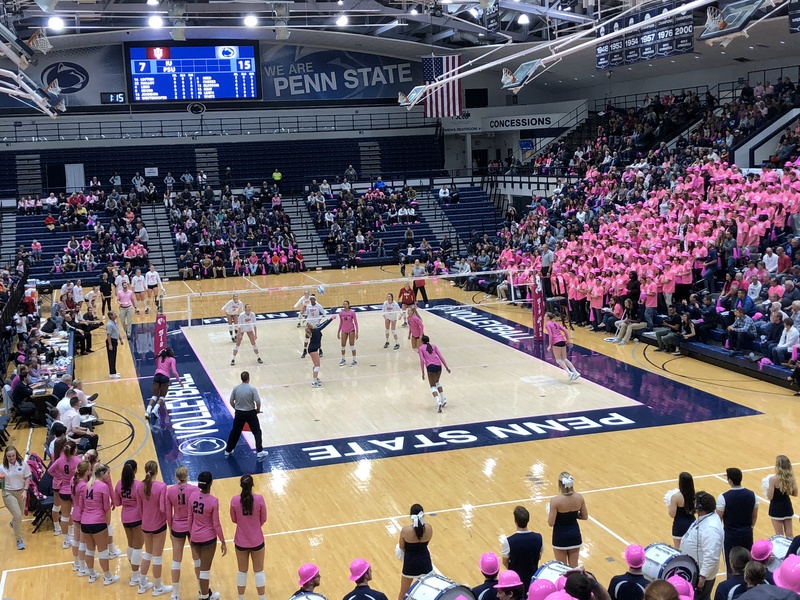 In the Rounds 1 and 2, Penn State notched back-to-back sweeps of Binghamton and Bowling Green. The Nittany Lions were led by 6-1 Jr. OH Deja McClendon (3.17 kills/set) followed by 6-2 So. MH Nia Grant and 6-4 Jr. Opp/RS Ariel Scott, who totaled 2.67 kills/set each. 5-6 So. L Dominique Gonzalez led the team with 3.33 digs/set, and Grant and Scott tied for the lead in blocks with 0.83 blocks/set. Penn State owns a 5-1 record against the Kentucky, with the most recent match being a 3-1 win on October 18, 1986 in Rec Hall. They’re a team that, if they were in the Big Ten, they’d be successful in the Big Ten. It’s just the whole getting used to the surroundings and it’s how you play, not who you play. We’re so used to Rec Hall and we’re so used to our fans but at the same time this is what we’ve been working for and we’ve done pretty well playing outside of our gym so far this year. It’s just another volleyball game. Inside the lines is where you’ve got to play it and that’s what they’ve been telling me – to just focus. Growing up, aspiring to be a Penn State Nittany Lion and watching them dominate the sport of college volleyball was just amazing. Being able to experience that yourself is totally different. I embrace every moment I can of it and it’s been awesome. We have the no-mercy mentality. We want to go in there and we want to win and we want to leave. No messing around.